The retail giant's physical stores drove the lion's share of its sales growth. And Walmart's e-commerce sales profile is very different from Amazon's. Though media coverage sometimes paints a different impression, there's more to the ups and downs witnessed by Walmart's (WMT - Get Report) business than simply its battle against Amazon.com (AMZN - Get Report) . To be sure, Amazon is a major long-term threat to Walmart, as Amazon continues taking share in a retail e-commerce market that in turn keeps taking share from offline retail. And it's a threat that's clearly on the minds of Walmart's leadership as it does things such as strike a deal to buy a majority stake in Indian e-commerce leader Flipkart and hatch questionable plans to launch a U.S. streaming video service. ...it helps to maintain a sense of perspective. Walmart's shares, which were beaten up in February following a disappointing January quarter report, are up over 9% on Thursday. That's after the retail giant beat July quarter (fiscal second quarter) estimates and reported its U.S. comparable store sales rose 4.5% annually, much better than a consensus for 2.3% growth. Walmart also moderately hiked its fiscal 2019 (ends in Jan. 2019) revenue growth guidance, as well as its comparable sales guidance for both its Walmart U.S. and Sam's Club segments. In addition, Walmart reported -- while still declining to share a revenue figure -- that its U.S. e-commerce sales grew 40% annually. That's an improvement from the April quarter's 33% growth, not to mention the January quarter's disappointing 23% growth. 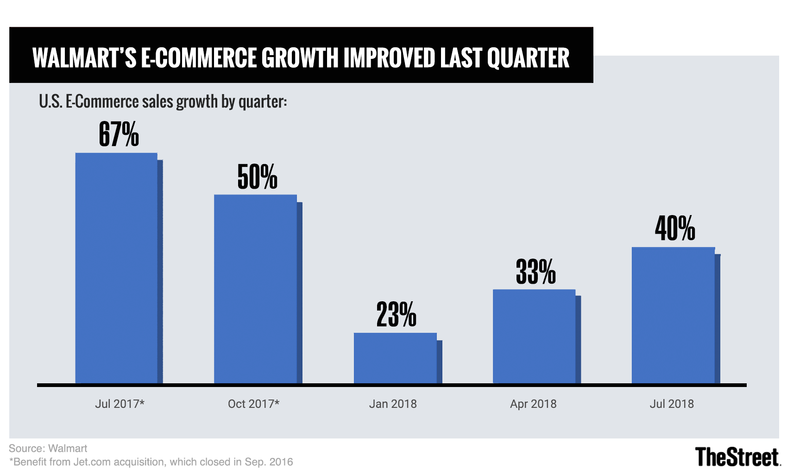 Nonetheless, Walmart is keeping its fiscal 2019 U.S. e-commerce growth guidance unchanged at 40%. And with the company stating that its 40% e-commerce growth only provided a one percentage point boost to Walmart's U.S.'s comparable sales growth, and a 1.1 percentage point boost to Sam's Club's comps, it's clear that e-commerce still only accounts for a small percentage of Walmart's domestic sales volumes. In July, research firm eMarketer estimated that Walmart's gross merchandise volume (GMV) for both direct sales and sales from third-party sellers would only account for 3.7% of a U.S. retail e-commerce market it expects to be worth $252.7 billion this year. That's a tiny fraction of Amazon's estimated 49.1% share, and translates into full-year GMV of just $9.3 billion. Walmart's U.S. e-commerce share is still tiny compared to Amazon's. Source: eMarketer. For comparison, fiscal 2019 analyst revenue consensus estimates for the Walmart U.S. and Sam's Club segments, which include e-commerce sales, are at $327.3 billion and $56.8 billion, respectively. Moreover, with Walmart's e-commerce unit providing free pickup at local stores for groceries and other items, and also (should a $35 order minimum be hit) providing free two-day shipping for a number of items sold at the same prices as Walmart charges at physical stores, it's fair to wonder what portion of Walmart's online volumes would have been handled the old-fashioned way at its stores if Walmart's website wasn't around. And also, what Walmart's profit margins look like for orders involving free 2-day shipping. Back in Q2 2017, research firm Slice estimated that groceries accounted for 26% of Walmart's e-commerce sales, and the number might be higher now. In its July quarter report, Walmart said its grocery pickup services are now available in over 1,800 locations. That's up by about 700 from last November. Walmart does deserve credit for how quickly it has rolled out its grocery pickup services on a large scale, both in terms of stores and product selection. To an extent, these moves put the company on better competitive footing against bricks-and-mortar rivals such as Target (TGT - Get Report) , Kroger (KR - Get Report) and Albertsons/Safeway. However, between the size and nature of Walmart's e-commerce sales, demographic differences and Amazon's efforts to improve both the economics and convenience of its grocery delivery services, Jeff Bezos's firm, which saw its North American segment sales rise about 25% in Q2 on an organic basis, probably isn't too worried at this point. And clearly, Walmart's strong July quarter sales had a lot to do with the performance of its traditional bricks-and-mortar operations. Here, the company seems to be benefiting from a mixture of good execution, aggressive pricing and favorable macro trends such as low unemployment and improving wage growth. Thus while Walmart investors can certainly take a victory lap in response to the company's latest earnings report, the report only means so much for Walmart's e-commerce operations in general -- and its long-term fight against Amazon in particular.